ARRA News Service: Conneticut GOP to Fred Thompson: Run, Fred, Run! Conneticut GOP to Fred Thompson: Run, Fred, Run! A different job' for Fred Thompson? - "All right, let's get the announcement out of the way," he told the crowd in Stamford. "'Law and Order' will return for an 18th season. "A woman in the back yelled, "But we need you in a different job!" Thompson smiled and said, "Can you speak a little louder?" 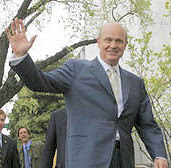 Tags: Connecticut, Fred Thompson, presidential candidate, Republican To share or post to your site, click on "Post Link". Please mention / link to the ARRA News Service. Thanks!